This long fluted point was recovered during excavations at the Thedford II Paleo-Indian encampment near Lake Huron in 1982. It represents one of as many as 13 unresharpened, finished or almost finished points recovered from one small area of the plow zone. These items were complete and undamaged except for breakage due to modern events such as plowing. They appear to represent a cache. This point is an example of the Barnes type like those recovered from the Barnes site in Michigan. It is made on a mottled unbanded variety of Fossil Hill formation (Collingwood) chert from outcrops 180 km to the northeast of the site. The narrow, thick nature of this item, along with long single fluting, a moderately deep basil concavity, a moderate expansion of the lateral edges from a narrow (under 20 mm) base, and a slight to more pronounced fishtail, are all characteristic of Barnes points. Also characteristic is the removal of a broad flake over the base of the main flute. Points similar to these are reported over most of the northeast. 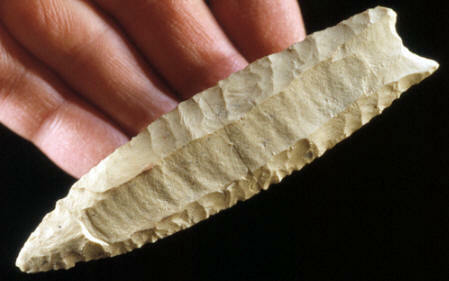 They bear some resemblance to Cumberland points from areas farther to the south and may be of the same age.